In the Hindu religion, Sarasvati (Sanskrit सरस्वती sarasvatī) is the goddess of learning, knowledge, and the arts including music and literature. Her name literally means "the one who flows," pertaining to her flowing thoughts, words, and music. In ancient India, Sarasvati was once the name of a powerful river that carved its way through the north western sub-continent and was originally regarded as a river goddess. Today, Sarasvati is still praised for her flowing, creative, purifying, and nourishing properties, which are associated with water. In modern Hinduism, Sarasvati is one of the three goddesses (along with Lakshmi and Durga) that represent the female consorts of the Hindu Trimurti (Trinity). Sarasvati is especially known as the consort of Brahma, the god of creation. Yet, despite her connection with Brahma, Hinduism places a great deal of importance on worshipping the goddesses themselves as paths to salvation. Unlike other religious systems that have often denigrated goddess worship, Hinduism deeply values and venerates the female energy itself as a principle of divine power (Shakti). Early Rig Vedic hymns dedicated to Sarasvati describe her as a mighty river that flowed down to earth from heaven. In ancient times, the mighty Sarasvati River most likely originated in the present headwaters of the Yamuna River, which flowed from the Himalayas. In ancient times, after they had left the Himalayan foothills, the waters of the Yamuna turned west instead of east at Paonta Saheb. Then the river flowed southwest across the Punjab and Haryana regions along the course of the modern Ghaggar-Hakra River in a pathway roughly parallel to the smaller Indus River to its west. The Sutlej flowed further east than it does today, and joined the Sarasvati somewhere near Bahawalpur. Eventually, the wide river emptied into the Rann of Kutch, which at the time was a more integral part of the Arabian Sea. Between 2000 B.C.E. and 1700 B.C.E., seismic activity caused the waters of the river's two main sources to change course. The Sutlej moved course westward and became a tributary of the Indus River. The Yamuna moved course eastward and became a tributary of the Ganges. The tremendous loss of water that resulted from these movements caused the once mighty river to become sluggish and to eventually dry up in the Thar Desert without ever reaching the sea. Without any water for irrigation or transportation, the dense population of the river basin soon shifted east with the waters of the Yamuna to the Ganges River valley. Late Vedic texts record the river as disappearing at Vinasana (literally, "the disappearing"), and as joining both the Yamuna and Ganges as an invisible river. Some claim that the sanctity of the modern Ganges is directly related to its assumption of the holy, life-giving waters of the ancient Sarasvati. In recent times, archaeologists using satellite images have been able to trace the course of the river. A small channel of water flows near Kurukshetra. A nearby signboard denoting the former path of the once great Sarasvati River can be seen along the main highway (Grand Trunk Road). Along the course of the Sarasvati, the Harappan Civilization developed. The worship given to Sarasvati as the river personified indicates that the Aryans had come to identify their culture with a specific location and were beginning to settle into a sedentary way of life. Some of the earliest known examples of writing in India have been found in the ruined cities that line the now dry riverbed of the ancient waterway, which has led some to the postulation that the goddess Sarasvati gained her later role as the personification of communication and the giver of knowledge due to the role the Sarasvati River had in the development of written language in ancient India. There is currently another river in India called Sarasvati; it flows from the west end of the Aravalli Hills into the east end of the Rann of Kutch. In this role as river goddess, Sarasvati bestowed bounty, fertility, and riches upon her human devotees. Her waters enriched the land enabling the production of food and therefore life. In Rig-Veda (6.61.7), Sarasvati assists Indra in the deed of killing the serpentine demon Vritra, who had hoarded all of the earth's water and undoubtedly served to symbolize drought. In the form of running water, Sarasvati was also widely praised for her ability to cleanse, and so she represented purity. Considering the Vedic fixation upon purity in rituals, it is not surprising that sacrifices were often performed on the banks of the Sarasvati River, which were held to be sacred. Because of her association with purity, Sarasvati was also associated with medicine and healing: in the Satapatha-brahmana she is invoked to heal sickness, and in the Rg-Veda she is closely linked to the Asvinas, twin gods associated with healing. Sarasvati is the earliest example of a goddess associated with the river in the Indian tradition, a role which would later be assumed by other goddesses such as Ganga, the feminine personification of the Ganges River. In the post-Vedic age, Sarasvati's connection with the river became deemphasized, and her current characteristics bear little resemblance to the early goddess. Later Vedic literature (such as the Brahmanas) associates Sarasvati with goddesses of speech such as Vac, Savitri, and Gayatri. Numerous epithets given to the goddess, such as Vagdevi (goddess of speech), Jihvagravasini (dwelling in the front of the tongue), and Saddavasini (she who dwells in sound), also note this connection. It is this speech that is thought to set human beings apart from animals, and so Sarasvati became connected with the higher faculties of the intellect. Sarasvati's function came to extend beyond speech into learning, culture, and wisdom as well. Sarasvati was not just the sound of speech, but also the intellectual advancement that made coherent speech possible. This connection can be gleaned in some of her epithets that connect her to elements of higher cognition, including Smrtisakti (the power of memory), Jnanasakti (the power of knowledge), and Kalpanasakti (the power of forming ideas). Sarasvati, then, is the intellectual power that distinguishes humans as beings capable of reason. Building upon this foundation is Sarasvati's connection with science, learning, and art, the products of the human intellect. She is considered the inspiration for the various arts and sciences, personifying the accumulated products of human thought, most importantly the Vedas, as are evident in her epithet Vedagarbha (womb of the Vedas). She is thought to be manifest in all places where knowledge is disseminated, such as in schools or libraries. She also provides inspiration for poets and artists, who praise her and ask for her help in finding inspiration. Sarasvati is also associated with anurāga, the love for (and rhythm of) music by which all emotions and feelings are expressed. Ultimately Sarasvati represents the rich plenitude of human culture. Additionally, a number of epithets suggest a primordial or cosmic significance of Sarasvati’s powers. Some epithets refer to her as a universal mother, such as Jagamata (mother of the world) and Visvarupa (she who contains all forms within her). Since the faculties that she protects have allowed humans to establish dominion over other beings, she has bestowed upon them an almost godlike nature, which suggests that she herself has dominion over the highest powers of the cosmos. Sarasvati's associations with rivers have not been lost altogether. She is still widely associated with purity in modern times. She also maintains iconographic association with clouds and thunder in post-Vedic literature, and is considered the patron deity of rain. For example, verse 40.14 of the Vamana-Purana connects Sarasvati to the clouds that produce rain, as well as all waters in general. Sarasvati is commonly depicted as a beautiful woman with snow-white skin, dressed in either pure white or yellow. Sarasvati is mainly associated with the color white, which signifies the purity of true knowledge. Occasionally, she is also associated with the color yellow, the color of the flowers of the mustard plant that bloom at the time of her festival in the spring. She is often seated on a white lotus or swan, which symbolizes her pure and transcendent nature (i.e. although rooted in the world, the higher faculties she represents allow her to rise above it). The sacred swan, if offered milk and water mixed together, is said to be able to separate the mixture and drink the milk alone. The swan thus symbolizes discrimination between the good and the bad or the eternal and the ephemeral. For Hindus, Sarasvati's seat upon the swan marks her transcendence over the imperfections of the physical world. Due to her association with this swan, Sarasvati is sometimes referred to as Hamsa-vahini, which translates into English as "she who has a swan as her vehicle." Sarasvati is usually depicted near a flowing river, which may be related to her earlier history as a water goddess. She is not adorned heavily with jewels and gold, unlike the goddess Lakshmi, but is dressed modestly, perhaps suggesting her preference for knowledge over material things. Sarasvati is generally shown to have four arms that represent the four aspects of human personality involved in learning: mind, intellect, alertness, and ego, or the four Vedas. In one hand she holds a book, which is the sacred Vedas, representing the universal, divine, eternal, and true knowledge as well as her impeccable understanding of the scriptures. In another hand she holds a garland (mala) of white pearls, betokening the power of meditation and spirituality. In another hand she holds a pot of sacred water, symbolizing her creative and purificatory capacities. Her fourth hand holds the Vena, a Sitar-like musical instrument symbolizing her mastery of all arts and sciences. Hindu goddesses are most always paired with a male consort who has comparable traits. 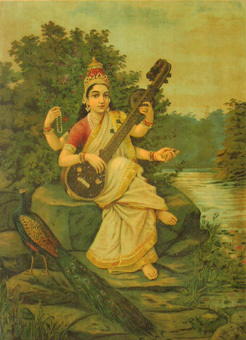 Sarasvati's consort is Brahma, the Hindu god of creation. In some myths, Sarasvati is also said to be Brahma's daughter. In his desire to create the world, Brahma is said to have gone into meditation, dividing his body into two: one half male, the other female. The female half is Sarasvati. Brahma promptly became smitten with his other half, and made love to her, creating the demigod Manu, who in turn created the world. Other myths suggest that Sarasvati originated from the tongues located in the various heads of Brahma when he created the world by way of creative speech. In this way, she is linked to be the creative sound, AUM, the sacred primordial mantra of the universe. Sarasvati is also related to the preserver god Vishnu. As with Brahma, she is sometimes said to be his tongue, or else held in his mouth. This renders her his co-wife along with Lakshmi. While Sarasvati represents spiritual, ascetic or religious well-being, Laksmhi represents a decidedly more worldly variation of well-being in the form of wealth and political power. As such, these two wives do not get along well. According to Brahma Vaivarta Purana 2.6.13-95, the quarreling of Sarasvati and Lakshmi along with Vishnu's third wife Ganga impels the god to give up Ganga to Shiva and Saraswati to Brahma. The Brahma-Vaivarta-Purana also links Sarasvati with Krishna, who is held in that text to be the ultimate reality. Here Krishna is said to have divided himself into male and female, purusha and prakriti, referring respectively to the spirit and matter which are necessary for the creation of the universe. Krishna's female half takes on five dynamic powers, or shaktis. One of these is Sarasvati, whose role is to pervade reality with insight, knowledge, and learning. In general, worshippers paying homage to Sarasvati expect blessings of eloquence, wisdom, poetic inspiration, and artistic skill. She especially promotes long life and success for philosophers, scholars, scientists, and artists, who are her most revered devotees. She is also trusted to remove defects in speech by granting charm and musicality to the voices of human beings. She is not only worshipped for secular knowledge alone, but also for the true divine knowledge essential to achieve moksha. She is currently a central deity in two specific festivals, Navaratri and Vasant Panchami. Sarasvati is worshipped during the Hindu holiday of Navaratri (festival of nights). The final three days of festival starting from the New Moon day are dedicated specifically to Sarasvati. On the ninth day, books and all musical instruments are ceremoniously kept near a statue or image of Sarasvati and worshipped with special prayers. No studies or any performance of arts are carried out as it is believed that the Goddess herself is blessing the books and the instruments. The festival concludes on the tenth day and the goddess is worshipped again before the books and the musical instruments are then removed. It is customary to study on this day, which is called Vidyarambham, or the "commencement of knowledge." During Vasant Panchami (a Hindu festival of spring dedicated to Sarasvati), which comes either at the end of January or the beginning of February, prayers are offered to Sarasvati, especially by artists, musicians, scientists, doctors, and lawyers. People usually wear yellow garments during this event, and Sarasvati is worshipped in a dress of that color. Often children are taught their first words during this festival and Brahmins are given food. Images of the goddess herself are worshipped by school children and university students alike, as are pens, musical instruments, and teachers. Additionally, special demonstrations of culture are conducted. At Banares Hindu University, there is an annual procession of faculty and students to mark Vasant Panchami, since this day corresponds to the founding of that institution. ↑ Kinsley, David, Hindu Goddesses: Vision of the Divine Feminine in the Hindu Religious Tradition. (Berkeley: University of California, 1988.) p. 56. Arya, Ravi Prakash. New Discoveries About Vedic Sarasvati. Indian Foundation for Vedic Science. 2005. All links retrieved August 19, 2015. Knapp, Stephen. Sarasvati, The Goddess of Learning. This page was last modified on 19 August 2015, at 16:46.